OMG, guys. I am tired. I’m excited to share this recipe with you, but I honestly just want to lie down and close my eyes. Why am I so tired, you ask? Well, do you know how hard it is to take an 11-year-old girl and a 4-year-old boy shopping? Not grocery shopping, but real shopping. We’re talking clothes, pencil cases, and books for said 11-year-old girl, who is basically 16, and everything has to be cool (or whatever word they use for “cool” these days) and match her personality and tastes just perfectly. So I wandered around the mall with her, from aisle to aisle, shop to shop, with a 4-year-old trying to knock things off of shelves, wanting to touch everything in sight and purposely, or “accidentally”, rather, brushing hangers off of racks and leaving a trail of clothes on the floor behind him. That kinda thing is really exhausting. So exhausting that, once you finally get in the car to go home, it feels good to finally sit down, and you’re waiting at the lights to leave the carpark, just staring ahead into space and you’re wondering “what the hell just happened! !”, while the lights have since turned green, and the sound of cars honking behind you snap you back into reality… and again you hear your 4-year-old whining that he chose the wrong toy and we have to go back. Yep. We just got back home a little while ago. Now the daughter is reading her new books, and … yeah, the boy is still complaining about his toy. Oh, that’s right, I have a recipe to tell you about! 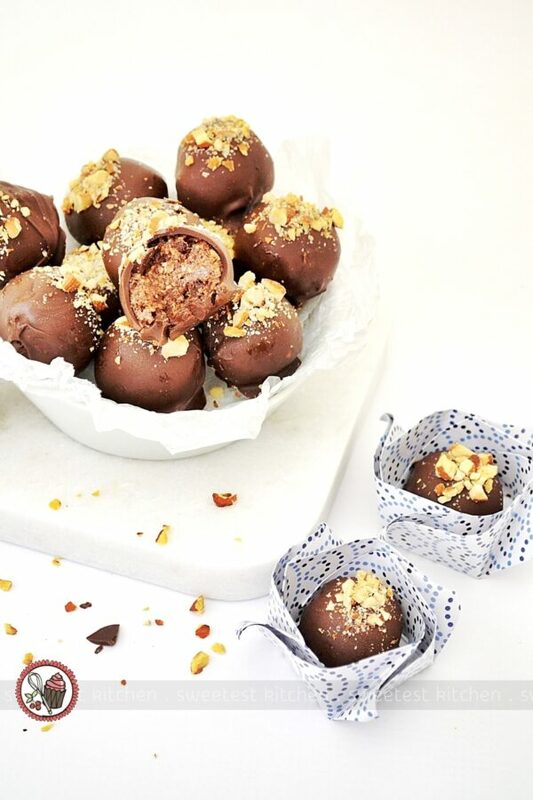 You definitely won’t find anything to complain about with these healthy chocolate-orange truffles! The recipe for these little citrusy chocolate morsels comes from my favorite foodie magazine, taste.com.au, in their recent healthy issue. Filled with good things like chia seeds, orange juice, dates and coconut, these truffles are perfect for an anytime snack. 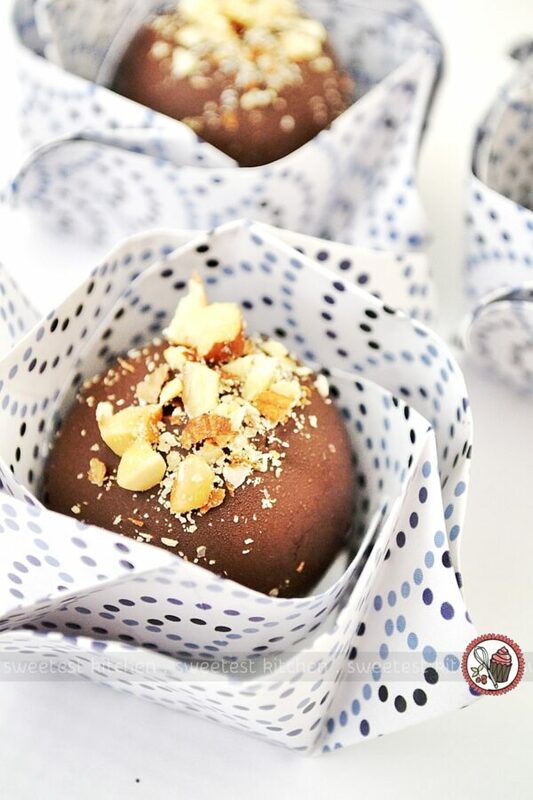 They’re not any more difficult to make than your average chocolate + cream truffles, and you don’t need to wait hours for the chocolate to firm up enough to roll into balls. These nutritious truffles are ready to dip into a bowl of velvety-smooth melted chocolate within 15 minutes. How do you like my little spotty truffle boxes, by the way? I made those myself! They’re so cute and pretty easy to make, especially if you’re already familiar with origami. Find video instructions at Origami Spirit if you’d like to learn how to make your own. The truffle filling stays rather soft, so they’re not quite suitable for snacking as is; they need to be encased in chocolate, for sure! The filling is a mixture of chia seeds, orange juice (the two are first mixed together to make a sort of orange jelly), almonds, orange rind, dates, coconut and cacao powder. These are simply blended together to create the filling. And, of course, this mixture is divided up into a plateful of orange-scented balls, which are then dipped into dark chocolate (the recipe recommends 85% cocoa, but I used 70%). You can leave the chocolate-coated balls as they are, to set, or you can sprinkle some finely chopped almonds on top (which look rather pretty, if you ask me!). 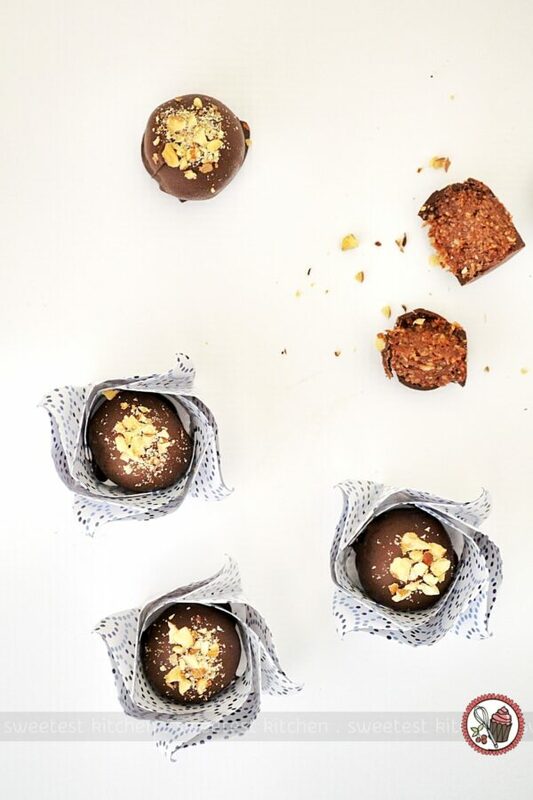 Full of nutritious ingredients like chia seeds, almonds, dates and coconut, these healthy chocolate-orange truffles are the perfect anytime snack! Meanwhile, process the almonds in a food processor until coarsely ground. Add the chia mixture, orange rind, dates, coconut and cacao powder and process until evenly combined. Roll level tablespoons of the mixture into balls. Line a baking tray with baking paper. Place chocolate in a heatproof bowl over a pan of simmering water and stir occasionally until melted and smooth. 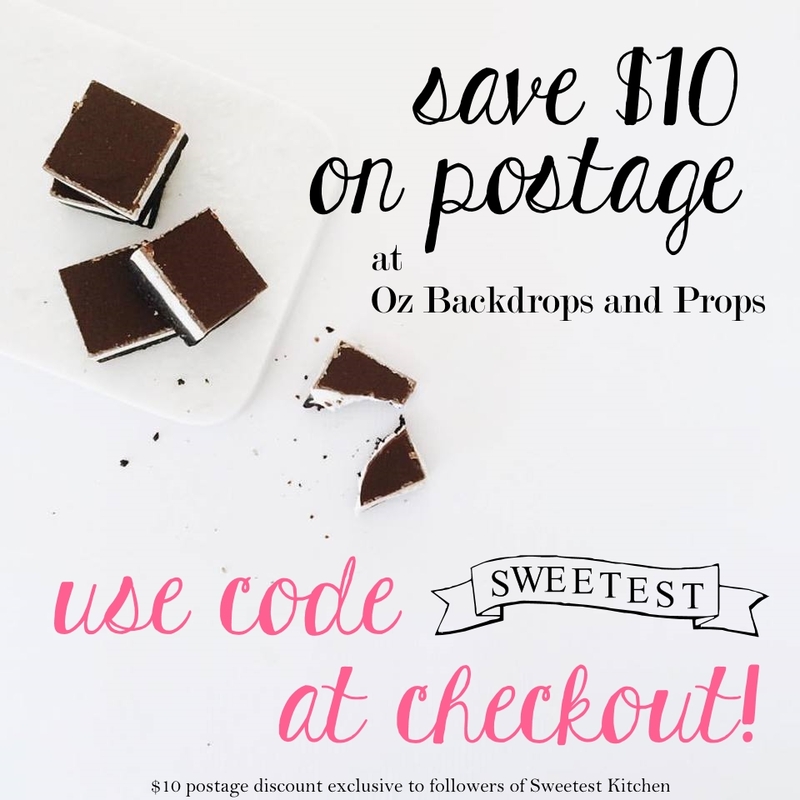 Dip one ball at a time into the melted chocolate and use a fork to evenly coat. Use the fork to transfer the truffles to the prepared tray, tapping off the excess chocolate (use another fork to gently push the truffle onto the tray, if needed). Sprinkle chopped almonds, if using, over the truffles. 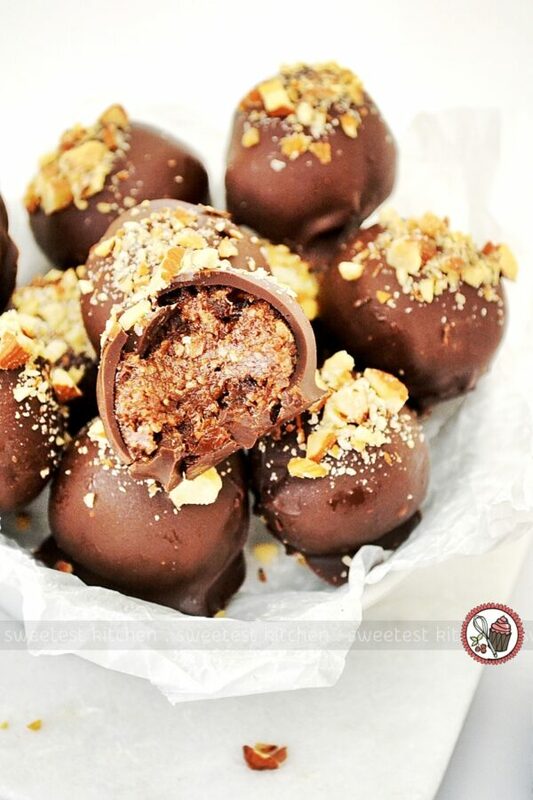 Set aside for the chocolate to set; if it's a warm day, place the truffles in the refrigerator to set. Will keep up to 2 weeks in an airtight container in the refrigerator. *Taste the filling mixture before rolling it into balls; I had to use about 2 teaspoons more orange zest to be able to taste the orange. *I used shredded, moist coconut which seemed to work just fine. *I used my standard Van Houten cocoa powder instead of cacao powder. *I used 70% Lindt chocolate instead of 85%.